Notejoy Plus or Premium allows you to add team members to libraries with Can view or Can comment permissions, restricting them to being able to only view existing notes or comment on existing notes. This is super helpful when you find you want a small group of collaborators editing notes while the rest of the team is simply viewing or commenting. This can be useful for sharing HR policies, onboarding materials, corporate communications, and so much more. 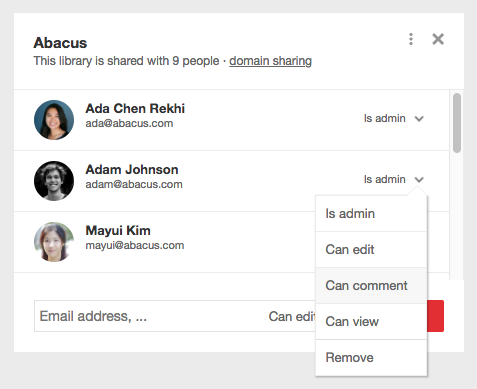 When inviting a new team member from the library sharing dialog, simply pick Can view or Can comment from the permission drop-down. You can also change an existing team member's permission by simply selecting the new desired permission from the drop-down next to their name.